Product prices and availability are accurate as of 2019-04-18 01:18:37 EDT and are subject to change. Any price and availability information displayed on http://www.amazon.com/ at the time of purchase will apply to the purchase of this product. Retro tabletop mini billiards - enjoy big fun on this compact billiards table, by Torre & Tagus. Perfect for an apartment, dorm room or any place with limited space. Set includes billiards table, 2 cues, chalk, rack, and set of Balls. 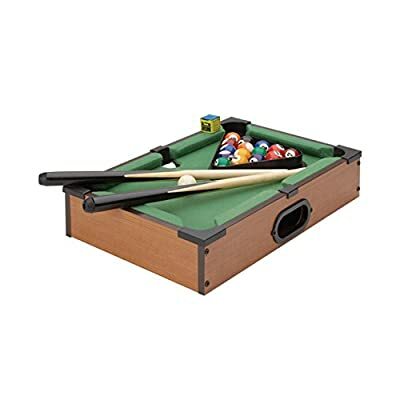 Mini pool table measures 14"W x 9.25"D x 2.75"H. Arrives gift boxed. Torre & Tagus specializes in sourcing the very best in clean, contemporary home decor and accessories from around the world. We create collections that reflect the newest trends in modern design and our style is synonymous with fresh, comfortable modern design in products that bring beauty to everyday living.